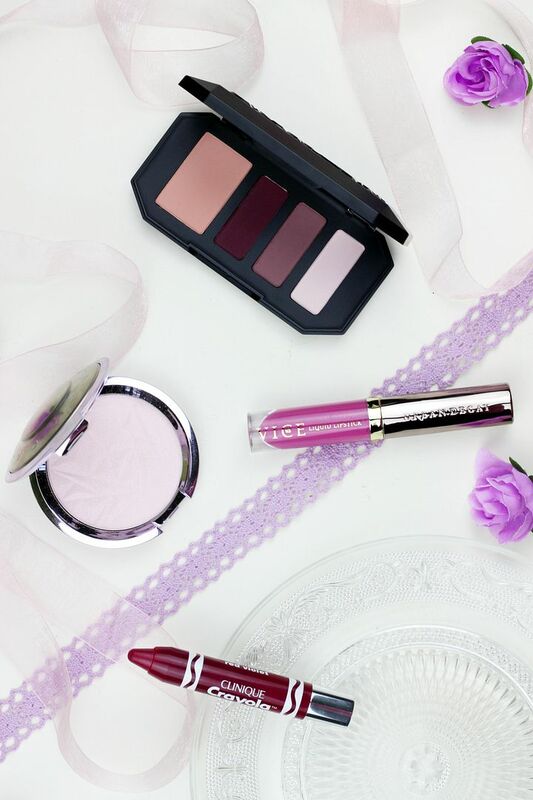 Purple is my favourite colour – for nails, for notebooks, for flowers… I don’t always wear purple shades of makeup but lately I’ve been incorporating more and more of the shade into my every makeup wardrobe. So the new Becca shimmering skin perfector in prismatic amethyst is the most insanely gorgeous highlighter – as soon as I saw it on instagram, I knew I wanted to try it. Becca’s highlighters are some of the very best out there, and this shade is an exciting new twist made from gold, violet and rose pearls for a unicorn glow. On the cheeks it doesn’t look purple but instead translates beautifully into an incandescent glow that makes skin look alive without looking too metallic. The formula is just as beautiful as the other highlighters and it melts into the skin and leaves cheekbones illuminated. For an easy take on purple eyeshadow, the Kat Von D shade & light quad in plum is my go to. It has four matte shades that all blend beautifully together; the formula on KVD shadows is gorgeous and a real pleasure to work with. The pinky shade is beautiful worn on its own all over the lid, with the darker plum hue also acting nicely to add definition and to intensify the purple colours. It’s a great little palette to have, and a good introduction to the KVD shadows. I’ve got two lip options because you always need options… the Clinique x Crayola chubby stick intense in red violet gives lips a just bitten effect that manages to look really chic. The formula is a complete dream to wear & the mango and shea butters leave lips really nourished. I think this would be the perfect pick for someone wanting to incorporate a little purple twist for your makeup without anything being too bold or unwearable. If you do want something bolder, the Urban Decay liquid lipstick in ZZ is worth checking out; the formula isn’t moisturising so not the easiest shade to wear but the colour on this is smooth, opaque and a beautiful warm lavender that leans on the right side of pink to stop this being too bright. It’s a really fun shade for spring, and I love it paired with the matte KVD shadows. Do you have any purple makeup picks?